Fluoride varnish provides extra protection against tooth decay. It is a pale yellow gel that sets quickly when applied to children and adult teeth using a soft brush. The varnish sets quickly. Fluoride varnish is a resin-based fluoride containing a 5 percent sodium fluoride. 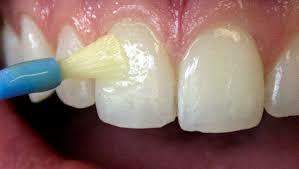 The "varnish" is painted directly onto the tooth. It has been approved by the Food and Drug Administration (FDA) as a treatment for dentinal sensitivity, as well as for use as a cavity liner.